HP Umpire James Hoye ejected Reds P Alfredo Simon for throwing at Brewers pitcher Chase Anderson in the bottom of the 5th inning of the Reds-Brewers game. With none out and none on, batter Anderson took two consecutive 0-0 pitches from Simon for a ball one and a hit-by-pitch, respectively. Replays indicate the first pitch, a 92-mph fastball, was located off the inner edge of home plate and thigh high (px -1.997, pz 2.499), and the second pitch, a 91-mph cutter, was located inside and head high (px -3.463, pz 4.946); Simon had previously been hit by an Anderson pitch, the third Red hit by the Brewers, the call was irrecusable. 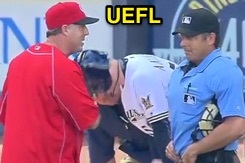 At the time of the ejection, the Brewers were leading, 2-1. The Reds ultimately won the contest, 7-6. This is James Hoye (92)'s first ejection of the 2016 MLB regular season. James Hoye now has -2 points in the UEFL Standings (-4 Previous + 2 MLB + 0 Irrecusable = -2). Crew Chief Jim Joyce now has -1 points in Crew Division (-2 Previous + 1 Irrecusable Call = -1). This is the 61st ejection report of the 2016 regular season. This is the 31st player ejection of 2016. Prior to ejection, Simon's line was 4.0 IP, ER, 2 R, 3 H, 2 BB. This is Cincinnati's 3rd ejection of 2016, 2nd in the NL Central (PIT 5; CIN 3; CHC 1; MIL, STL 0). This is Alfredo Simon's first ejection since September 26, 2010 (Bill Welke; QOC = U [Throwing At]). This is James Hoye's first ejection since August 23, 2015 (Yasiel Puig; QOC = Y [Balls/Strikes]). Wrap: Cincinnati Reds vs. Milwaukee Brewers, 5/28/16 | Video available via "Read more"